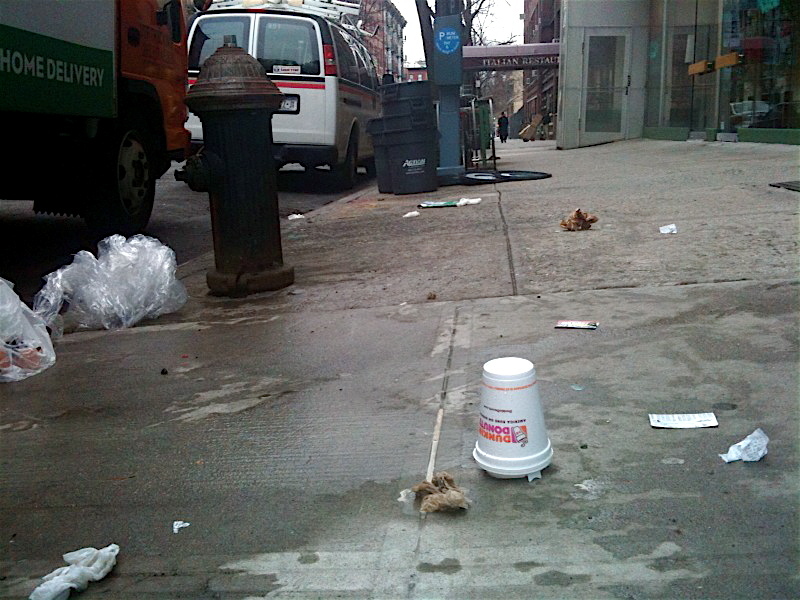 NYC produces about 50,000 tons of trash daily – —at a cost of almost $1 BILLION per year for trash collection and exportation. Our waste, collected by high polluting trucks, is primarily sorted at waste transfer stations located in low-income neighborhoods, then trucked again to out of state landfills, threatening air quality and drinking water, while also generating significant greenhouse gas (GHG) emissions. ONE BILLION dollars per year to get rid of our trash! This expenditure will surely increase with rising fuel pries. Where does it all go? Spent-Styrofoam trays are exported to Va. and Pa. having had a mere 20 minutes of purposed life, subsequently to last for half a millennium in a landfill in someone else’s backyard – out of state, out of mind, or out of most people’s minds. Currently, there is only one NYC DoE school, the new Harbor School, using a (new) dishwasher and washable food service-ware. Department of Health requires the reusable trays/plates to be washed at 180 degrees. Multiply that times 850,000 school meals per day in NYC and that translates to an enormous amount of water and energy. Dishwashers are expensive to purchase and to maintain. Add the cost of labor, soap and maintenance. Dishwashers, however, have come a long way in the last 20 years! Energy and water efficiency are key to current design innovations. Styrofoam (polystyrene) manufacturing also requires energy and water, as well as petroleum and styrene, and leaves a long trail of incurring health and environmental costs after its very short lifespan as a single-use food container. It is time to assess the true costs of Styrofoam tray use in NYC city schools versus reusable service ware (dishes and cutlery) and high-efficiency dishwashers. 3 BILLION Trays thrown away over the past 20 years! NYC public schools have been throwing out 850,000 polystyrene (Styrofoam) trays per day (except for Tuesdays, as of March 2010), totaling 153,000,000 trays per school year, for over 18 years. This adds up to approximately 3 billion polystyrene trays since the early 1990’s when NYC schools first started using Styrofoam trays. NYC public school students eat as many as 3 hot meals per day directly off of Styrofoam, a petroleum-based product composed of the chemicals, benzene and styrene. 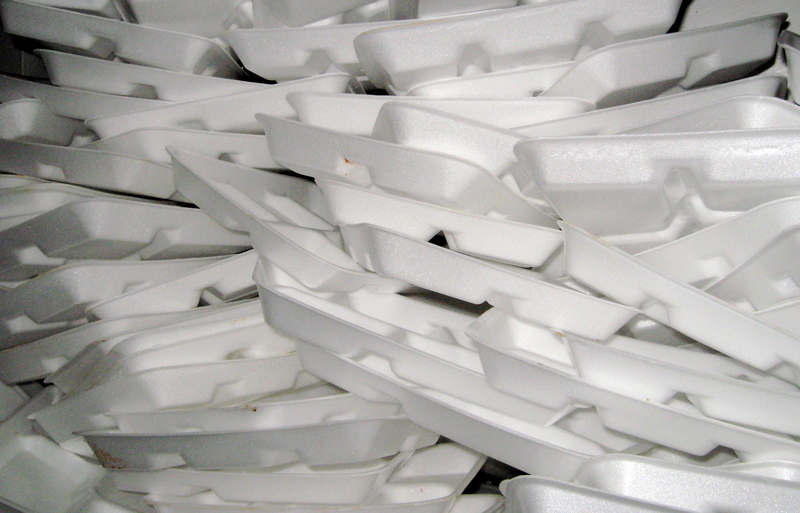 Polystyrene can cause cancer and is not biodegradable. It crowds our landfills and is a major source of ocean pollution. Low income children are disproportionately impacted. Styrofoam Out of Schools (SOS) is working collaboratively within the New York City (NYC) public school community to reduce cafeteria waste by first eliminating and then finding alternative solutions to Styrofoam trays. Our common ground, alliance-building approach, launched in spring 2009, resulted in the citywide implementation of TRAYLESS TUESDAYS which reduced polystyrene tray use by 2.4 million per month in NYC public schools as of March, 2010 (DoE press release)!